Today’s Sundays with Friends is brought to you by………..
Oh yeah, I didn’t get one together for you today…I was at Virginia Beach all weekend for some much needed rest and relaxation, and I had a lovely time. I have soooooooooo much to share with you though! So many delicious dishes, and beautiful sights. Stay tuned! 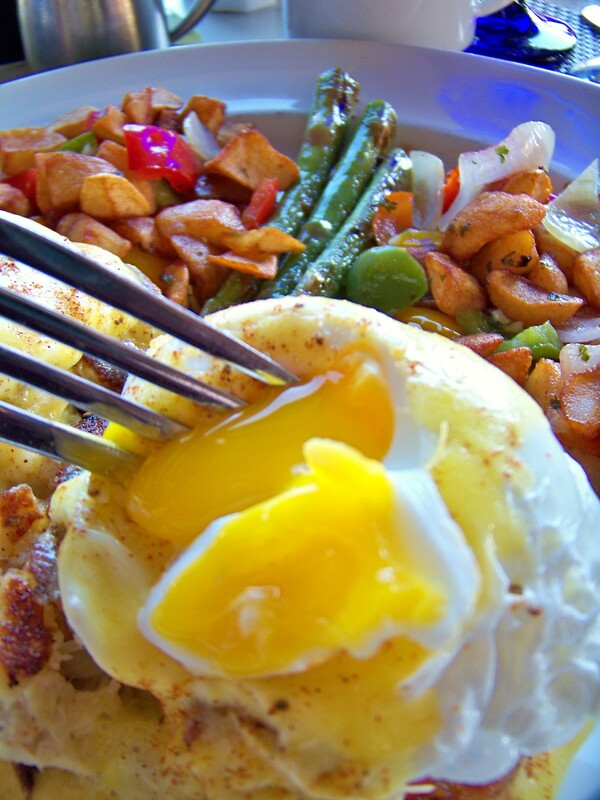 For now…take a look at this perfectly poached egg on top of my Blue Crab Benedict at Catch 31 on Virginia Beach. There aren’t words to describe this dish….none at all….nope….nada.…(silence). Can’t forget the amazing Cheesecake we ordered after recommendation from the Chef on the previous day’s lunch. Yeah, so we had Cheesecake at 10:30 am before heading back home. But, it made the drive back home so much more pleasurable. I can’t wait to make it back to Catch 31! Surely one of the most wonderful restaurants I have ever eaten at…atmosphere, waitstaff, Chef, and food! Next Post Will Cook for Foo: Week 13 – Does God use Photoshop?